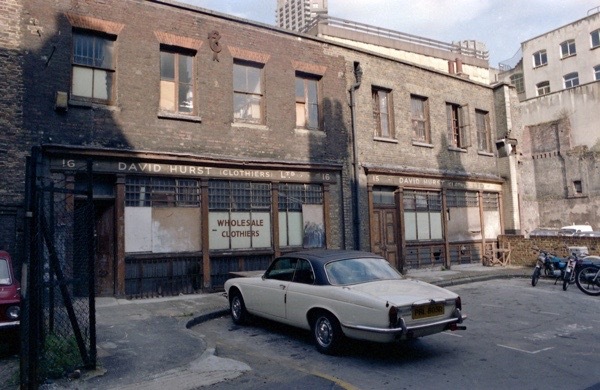 Enigmatic Photographer Jeffrey Johnson deposited a stack of his appealing pictures from the seventies and eighties with Archivist Stefan Dickers at the Bishopsgate Institute recently, including these photos of favourite spots in London. 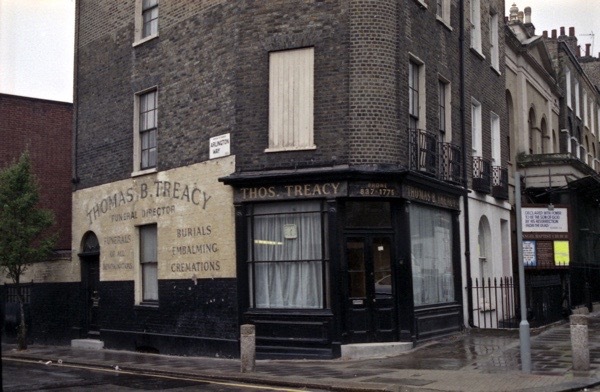 I cannot resist the feeling that Jeffrey is one after my own heart when I examine these characterful pictures of the capital’s forgotten corners – a few are familiar places but I am reliant upon my readers to identify the rest. These are fantastic, I never thought I would see Bill Mays cafe again, Jays Stores was in Battersea, they closed the shop in the photo years ago but they still have another shop that looks almost exactly the same in Rotherhithe near Surrey Quays shopping center it’s very old fashioned, George Greenwood used to be a well known Speedway rider in his day and he used to build the Rotrax engines but the photo shown hear looks to be maybe 1970s ? 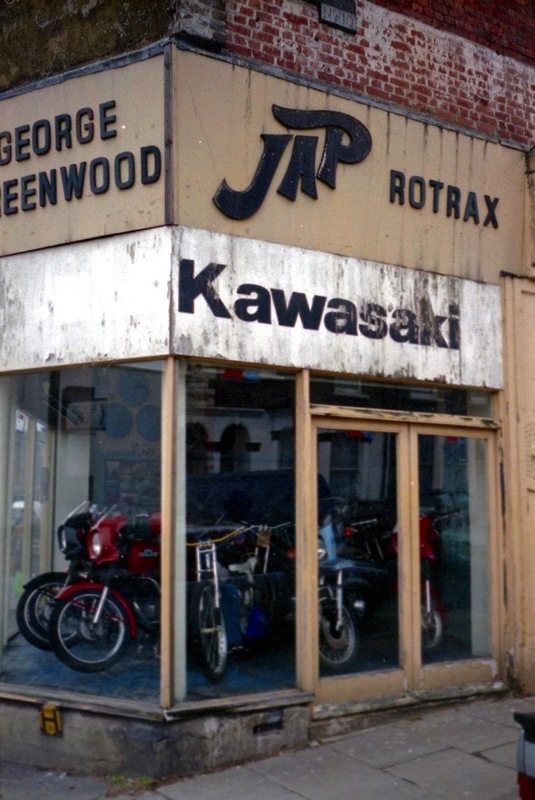 and George Greenwood was long dead by then so I think the shop was probably just trading under his name, my favorite photo hear is the one of Apostal’s, if the outside is anything to go by goodness knows what the inside must have been like. A lovely set of photos! It might just be me but these seem later than the bulk of the photos you publish. 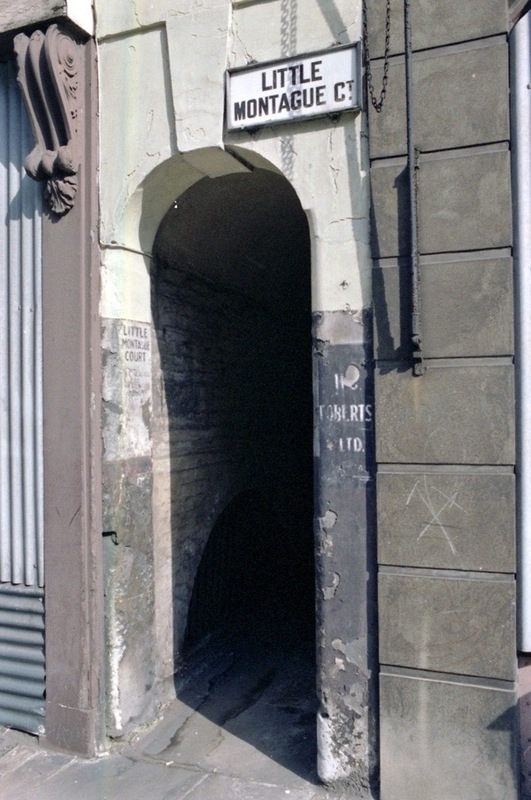 A tantalisingly close link to the past! 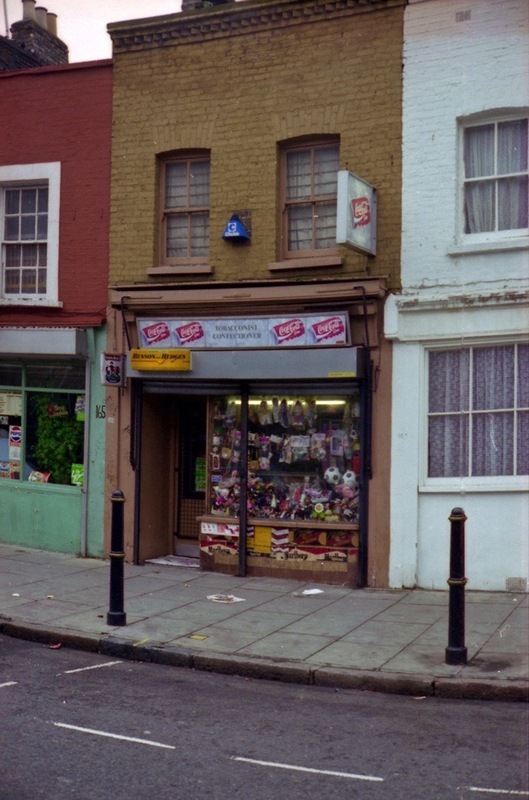 The beginnigs of corporate facias in the William Hill shop and the Coke branding of the newsagents. The newer cars: the type I would have driven in the late 1990s. 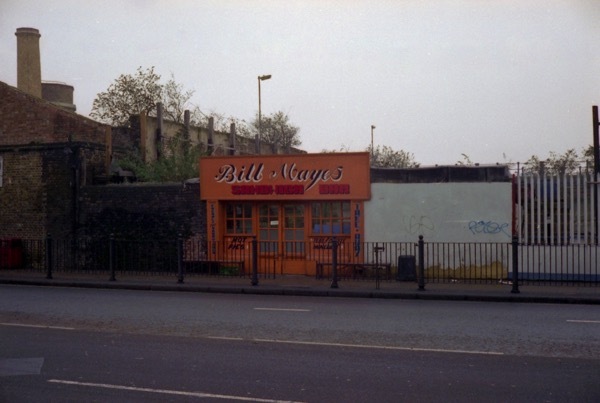 While I can’t name the places the time seems that it could be early 1990s. 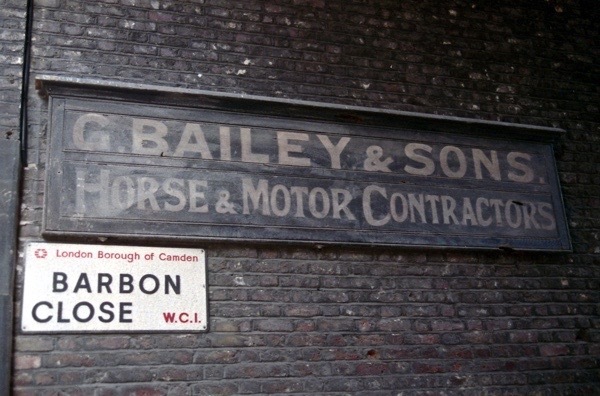 Even though that’s within walking distance of today the change is immense – especially in the places I recognise between St Pancras and King’s Cross. I am training to be a sign writer. I have been following your marvellous blog for sometime now and always enjoys the eclecticism of your posts…. But this one’s for me on a clear April morning. 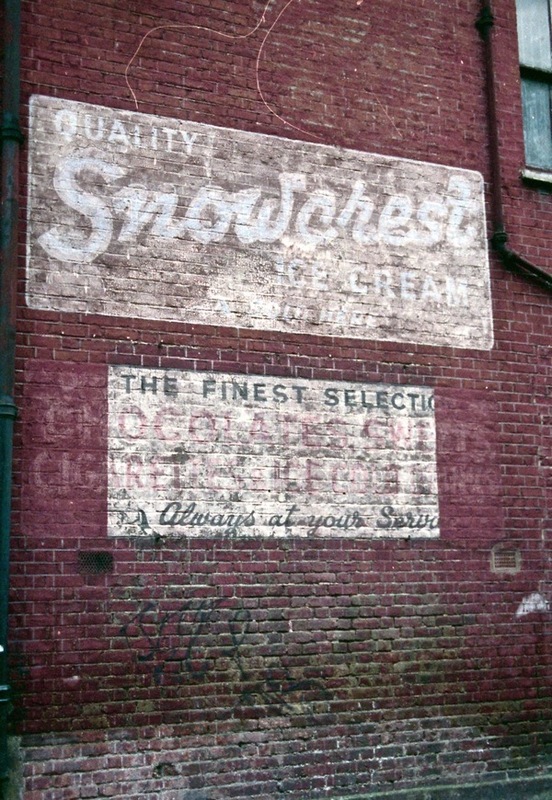 Beautiful esp the ghost signs. 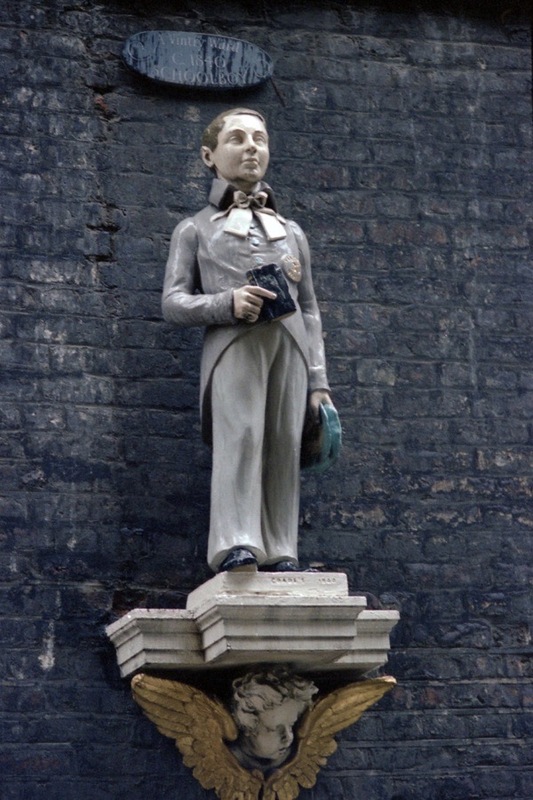 The last picture of the figure of a schoolboy made from coade stone was taken at the Vintners Hall, City of London. Rd I believe. 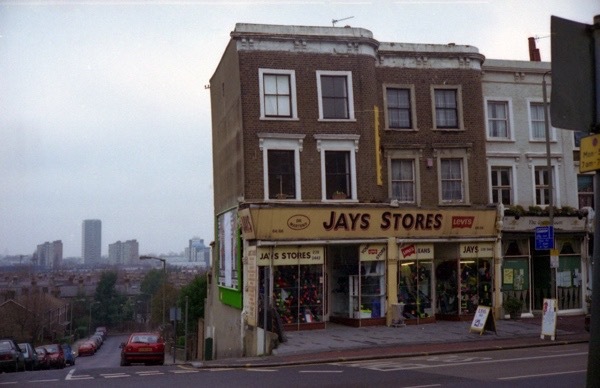 Jay’s Stores is still going too and the shop in the photograph looks familiar, but doesn’t seem to match its current location, or at least the shopfront. 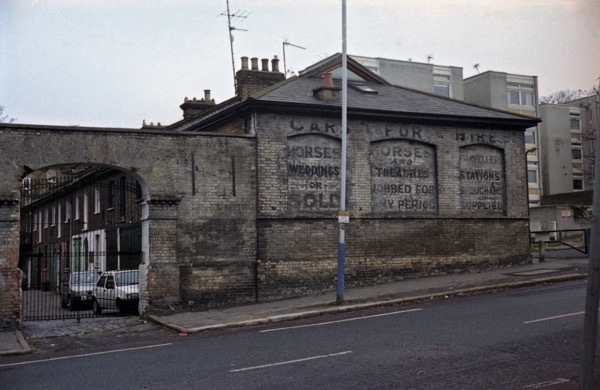 In the 1860s, my great-grandparents, Nicholas and Elizabeth Makepeace, and six of their children – there were 16 eventually – shared a small terrace house with another family in nearby Wharfdale Road. My great-grandfather, born in Wylam, Northumberland (also the birthplace of the ‘Father of the Railways’, George Stephenson), was an engine fitter and had followed the railway network as it expanded across the country . . . 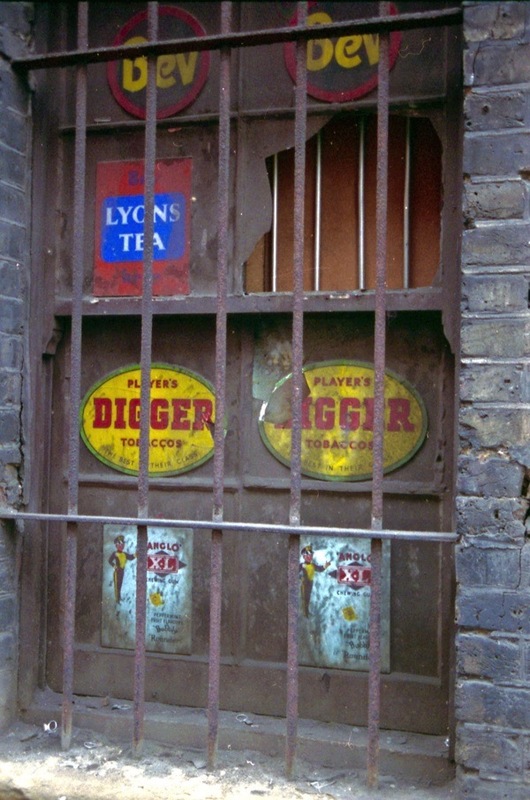 Wonderfully evocative photos of streets known so well. The King’s Cross now a memory almost obliterated by ghastly homogeneous, faceless concrete towers. 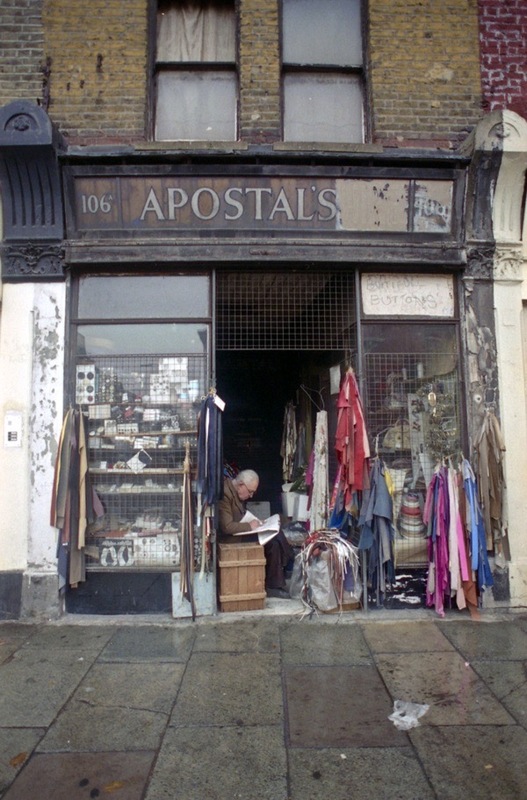 Apostal’s was on Upper St, N.1 . 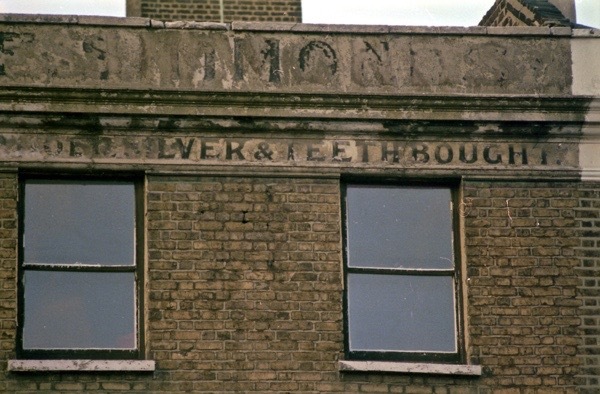 Almost opposite the old dispensary. I think it’s another restaurant now. Great photographs again. 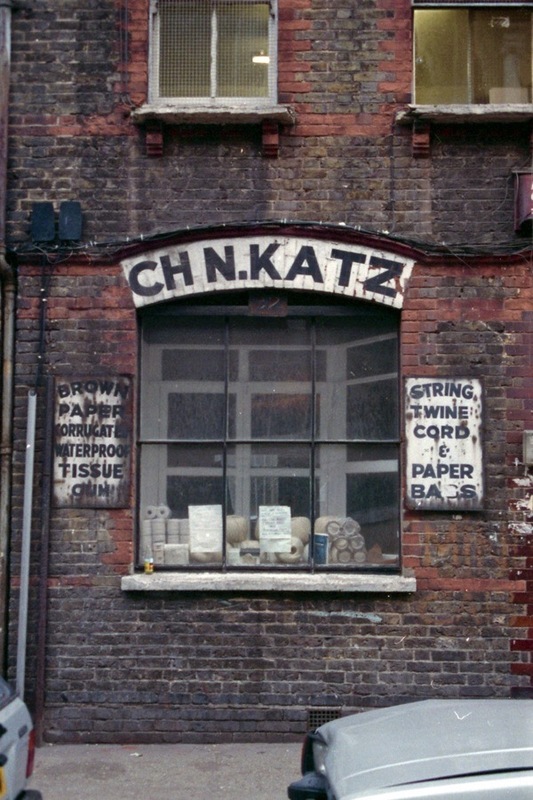 It never ceases to amaze me when I see previously unknown photographs of London. J.J. & S.W. 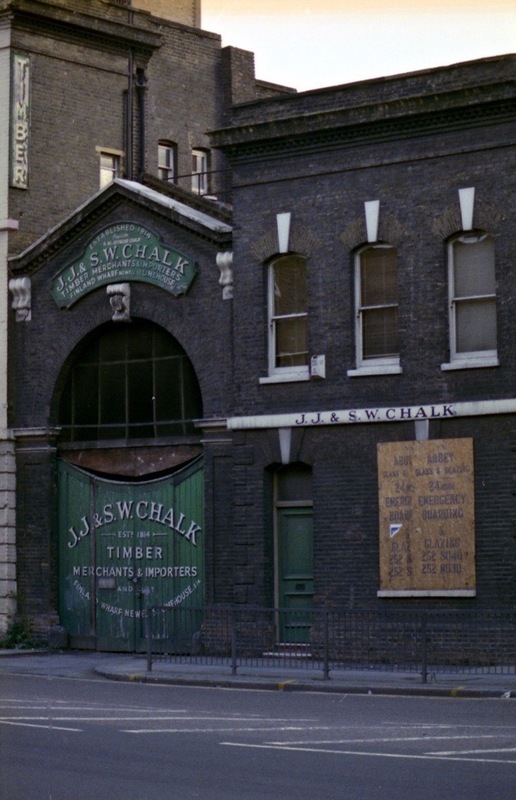 Chalk was in Commercial Road, not Kings Cross. I believe the building is now apartments. The 19th photo counting down was taken in Cedars Road, Battersea. 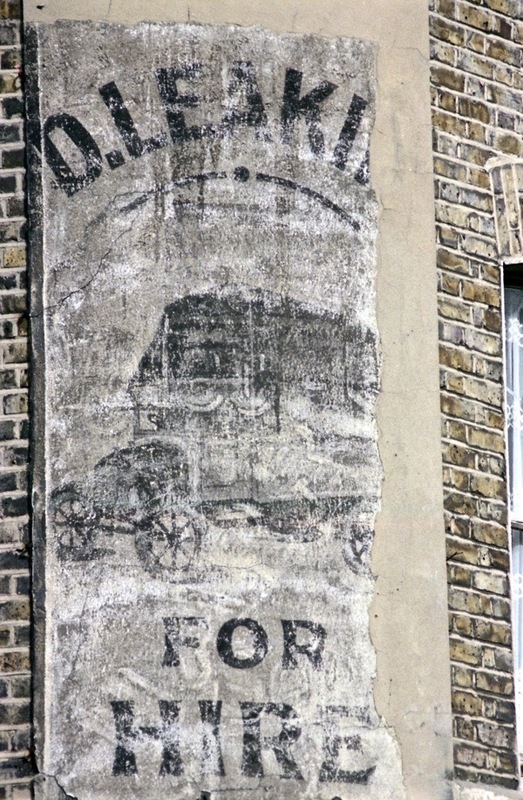 The one that says ‘cars for sale’ It also says ‘Broughams supplied, horses sold’. 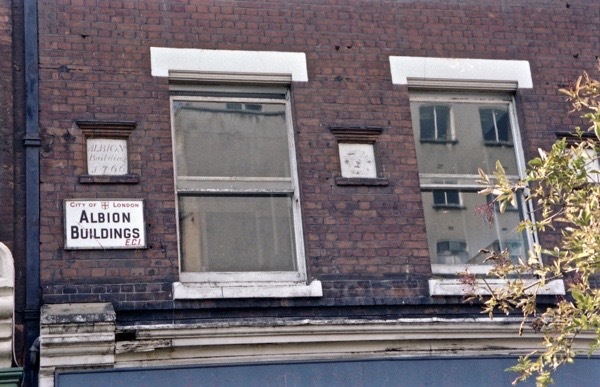 As far as I know the sign is still there. 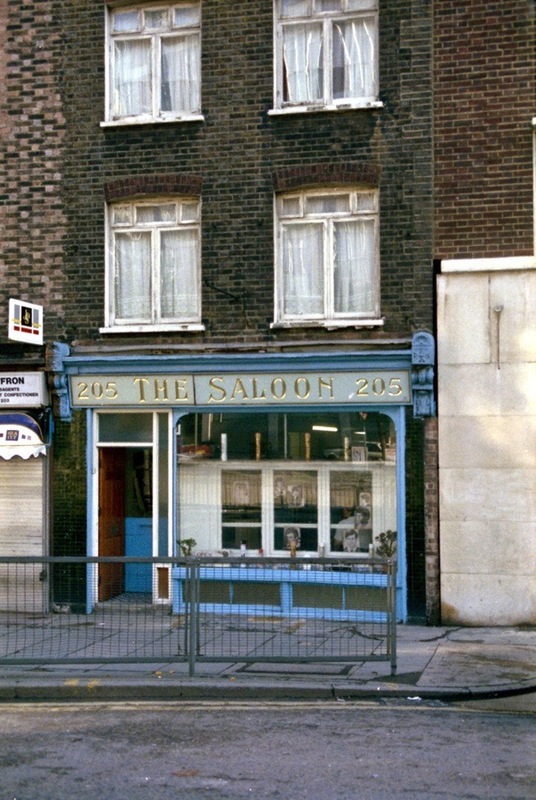 I think the Saloon was on King’s Cross Road at the Pentonville Road end. 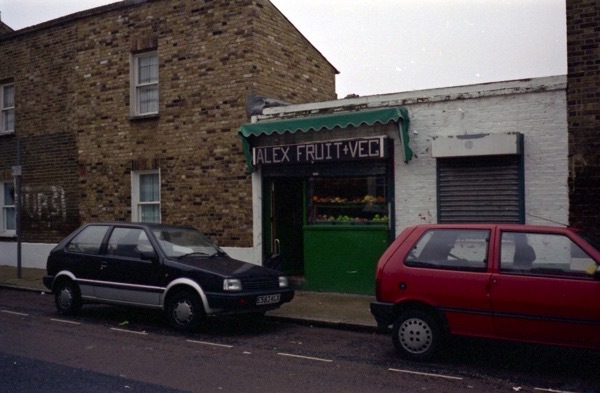 I used to go to an Italian caff nearby in the 1970s. I thought the child statue was outside a former school in either Leather Lane or Hatton Garden. Here’s a link to the photos that I took there (see my earlier comment) in 2009.
crossed that no philistine will ever cover it up. 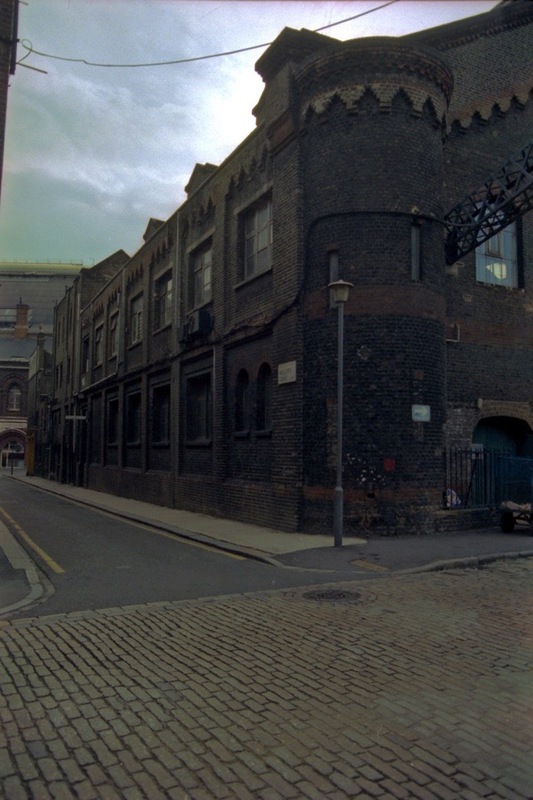 Yes, Apostles was on Upper Street, N1 more or less opposite Gaskin Street. 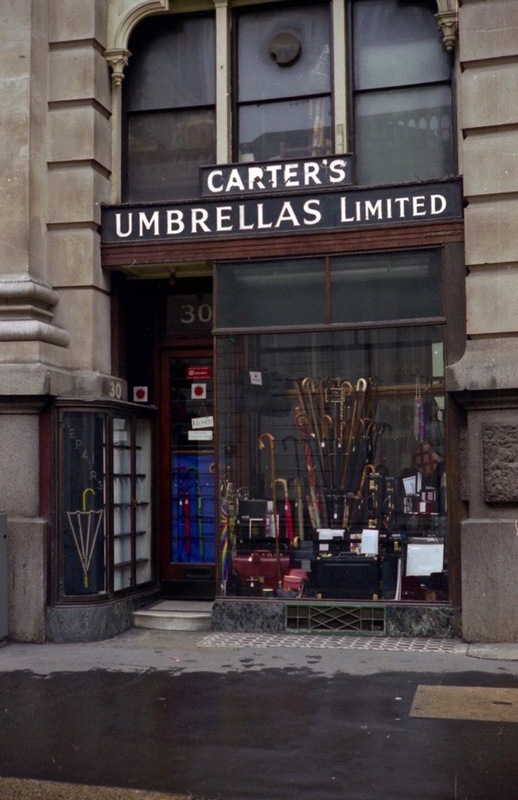 It was still operational (I bought some blue leather there) in the mid- 1980′s. Spooky! Or is it what goes round comes round? In 1963, at the age of nineteen, when John Claridge first became a freelance photographer he had his first studio in Albion Buildings. 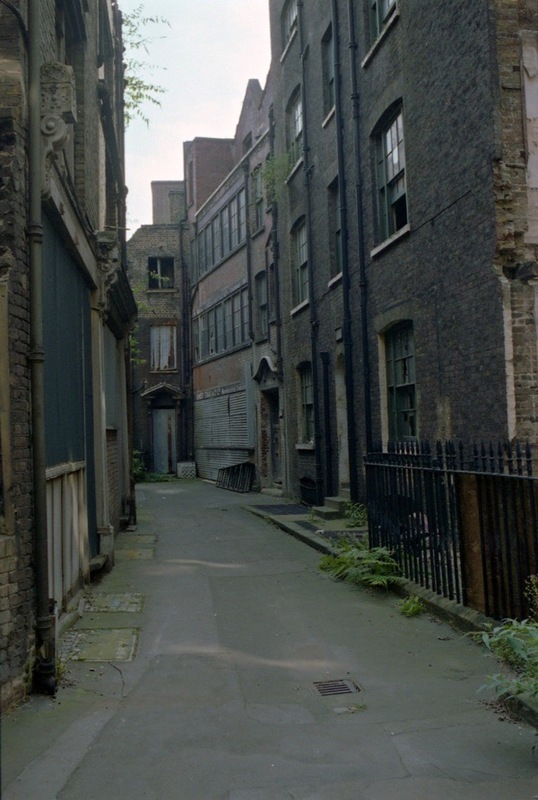 Little Montague Court was behind Little Britain, between Montague Street and Albion Buildings. 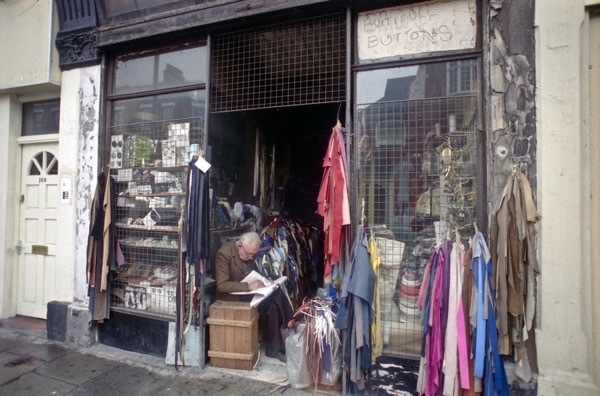 I remember there was a button wholesalers in the courtyard there once. 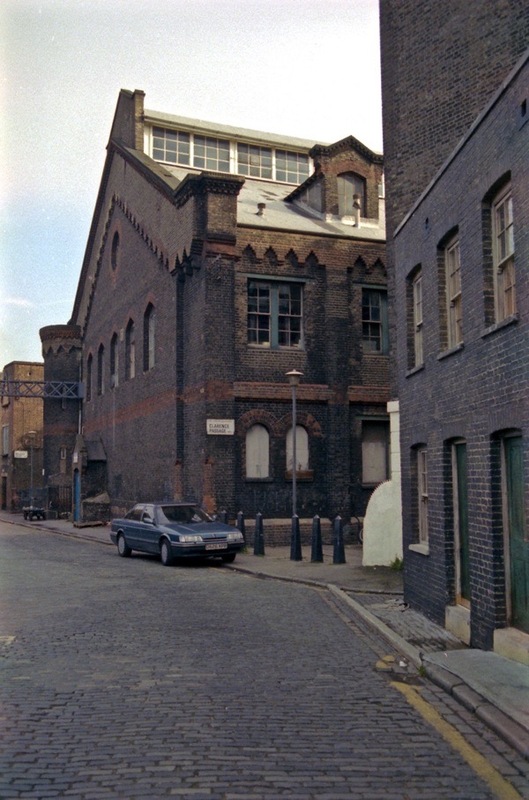 All gone now, demolished in the 1980′s. 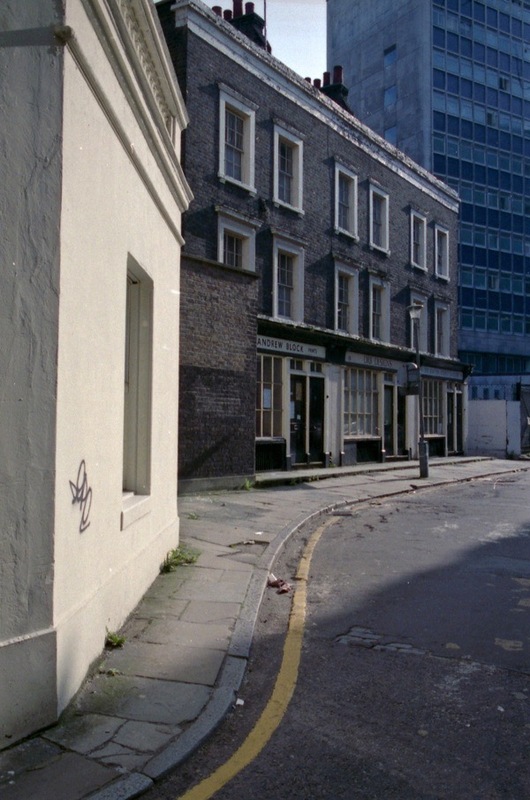 Beautiful pictures- London the way I remember it from my childhood visits. 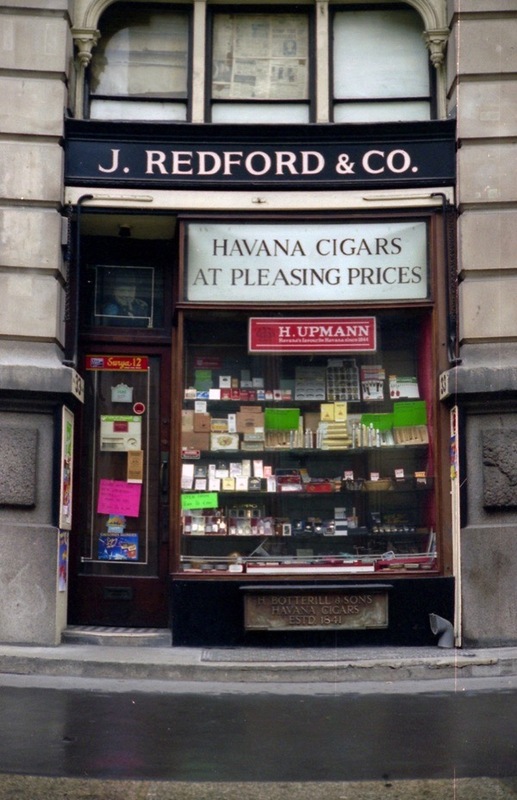 In 1939 Maurice (born 1 Mar 1909) and Peter Apostal (b 10 Apr 1910) were at 106A Upper Street, Maurice was managing director and Peter the company secretary of a catering distribution firm. 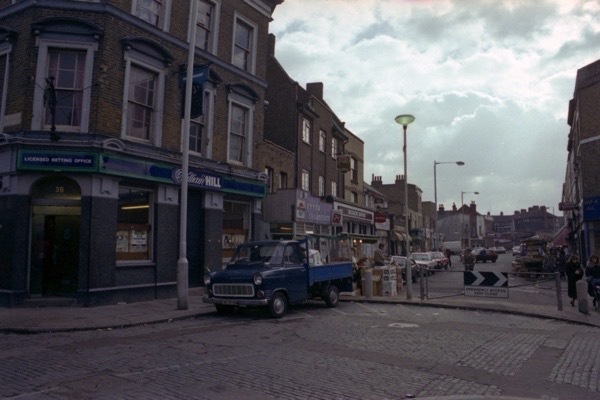 Wow, these are some truly stunning images of Cheney Road, King’s Cross NW1. 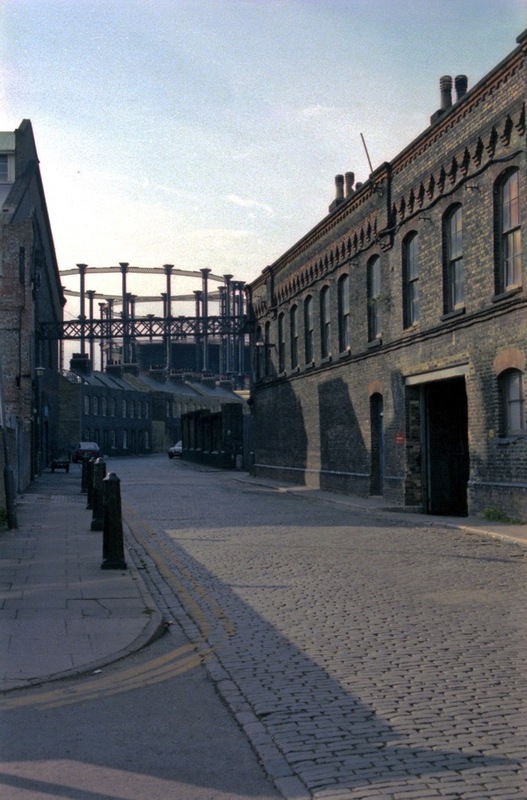 Very interesting and very rare to see the cottages that were just north of the German Gymnasium and Stanley Buildings, heading up to Battle Bridge Road and the gas holders beyond. 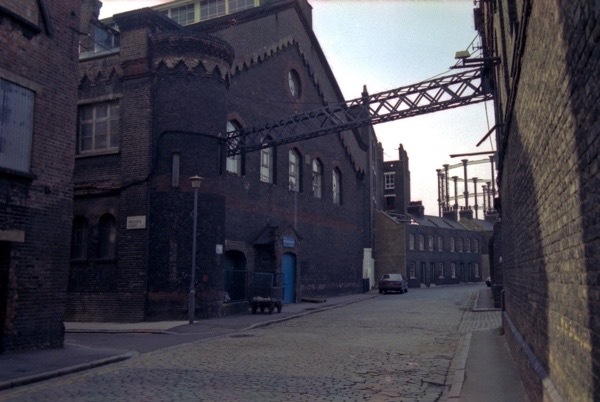 Jeffrey Johnson tells me that the cottages and the pub near the German Gymnasium were in fact a film set created for the Charlie Chaplin film so were merely false frontages!